When owners or managers of supplement, healthy food, cosmeceutical, nutraceutical or other natural product manufacturing companies invite me in to talk about their packaging lines, it’s often because their companies are doing well – so well, in fact, that production may be failing to keep up with sales or is on the verge of failing to keep up with sales. While this is a problem that many owners and managers would be grateful to face, it’s still a problem, and one that can determine whether or to what extent a company can capitalize on the success of its products. Given the importance of production speed, it is common for people to address a disparity in sales and production by identifying a bottleneck and then investing in a machine to release the bottleneck and let production rates fly. However, increasing potential production rates in one area can adversely affect production in other areas, and increase costs, too. In many cases, growing natural products companies package their products with a combination of manual methods and semi-automated filling, capping, labeling and other machinery as costs permit. If the capping machine, for example, cannot keep up with required production rates then investing in a faster capping machine seems a sensible action. But while replacing the slower capping machine with a new one that caps at 100 bottles per minute may eliminate the bottleneck, it may also create a new bottleneck downstream at the labeler, tamper-evident neck bander, or the cartoner since their production rates may remain much slower than 100 bottles per minute. Since a packaging line moves only as fast as its slowest element (typically the filler), every machine in the line needs to operate at or above the desired speed. Any that run much slower than the rest may cause bottlenecks requiring turntables, conveyors and accessories to manage the differences in speed. Any that run faster than the rest are also costs given their full capabilities cannot be exploited. When considering a faster machine, it is vital to consider upgrading the other machines to match the faster rate of production. Accurately forecasting a company’s growth and production requirements is a tricky business and thriving natural products companies may be inclined to invest in new packaging machinery that’s needed to accommodate the rosiest growth trajectory, especially given the appealing tax breaks on capital equipment and the low interest rate environment. But investing in more speed and capacity than is necessary not only increases costs today without a corresponding benefit but it also adds the risk that if and when the projected growth is achieved, the once modern machinery may be worn to the point that repair or replacement is needed or worse, it may be made obsolete by new technology. Building a modern, entry level packaging line today with advanced automation technology that delivers the required production rates now and can also keep pace with the company as its production needs grow in the near term makes far more sense. If done properly then the mostly manual packaging line producing 10 bottles per minute may be easily increased to 40 bottles per minute with significant labor savings and then grow to produce 60-70 bottles per minute or more as needed at a very reasonable cost. If growth outpaces the original packaging line then these packaging machines may be sold fairly quickly to help fund the next packaging line since their relatively low cost and versatility assures a brisk secondary market. The fastest, most expensive machines become more difficult to sell used since there is a far smaller market at that price range. Automating manual tasks such as inserting a desiccant into a bottle necessarily and immediately increase production rates and save on labor. But as the packaging line becomes faster and more automated, it also becomes more complex and downtime becomes more expensive. Each machine, conveyor and accessory needs to be set to precisely match the product and the settings of the other machines to achieve maximum speed, accuracy and efficiency. If one machine goes down while running at 20 bottles per minute, for example, a person can fill in while it’s being fixed. But at higher speeds, that isn’t always possible and production suffers. In many cases, investing in faster packaging machinery also requires an investment in a full-time line maintenance and operations person who can become intimately familiar with each machine. For contract packagers and others who need setup, cleaning and changeover to move quickly, such a skilled, experienced technician who knows how to get every last bottle of production out of the packaging line becomes one of the company’s most valuable assets. Investing in automating manual packaging tasks and in upgrading semi-automatic packaging machinery are obvious ways to speed production but they do trigger other considerations, some that may be costly. If cost isn’t an issue then invest $1 million in state-of-the-art, automated, high-speed packaging machinery and a spacious facility to house the entire packaging line. If cost is an issue then look at the overall packaging line as a system and consider adding automated machinery incrementally to keep pace with production goals while minimizing both the risk and the investment and ensuring the desired production increase is fully realized. John Deitz is president of the family-owned Deitz Company, Inc. (www.Deitzco.com) founded in 1959. 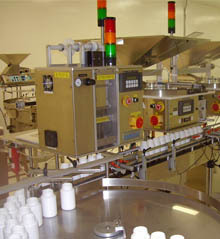 The company designs and manufactures tamper-evident neck banders, heat tunnels, tablet and capsule counters, desiccant and cotton inserters and other automated packaging machinery and accessories at its Wall, New Jersey headquarters. Deitz also provides complete filling line design and installation services. Contact John at 732.681.0200 or sales@deitzco.com.